The leader later even justified his statements. In a brazen display of communal hatred towards a politician in the assembly, Bharatiya Janata Party’s OP Sharma referred to Aam Aadmi Party’s Amanatullah Khan as a ‘terrorist’. 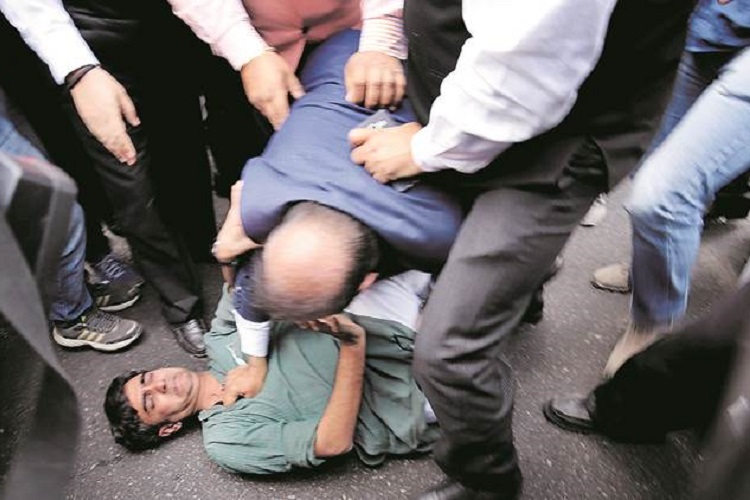 The incident happened on Monday when Sharma, who represents east Delhi’s Vishwas Nagar constituency, made the controversial remarks during a discussion on bureaucracy. During the discussion, Sharma said, “You say we are protecting bureaucrats, but that is not the case. If an officer does something wrong, usko thokne mein hum aapse aage hain (We know better than you how to fix errant officers).” But Khan, an MLA from Okhla, interrupted his speech and raised an objection against the kind of language that he used to which Sharma got furious. “Kukarm karega to jail jayega. Atankwaadiyon ki tarah kyun baat kar raha hai. Aadmiyon ki tarah baat kar. Aatankwaadiyon ki tarah nahin. (If you indulge in criminal activities, you will go to jail. Why are you talking like a terrorist? Talk like a human being, not like a terrorist),” Sharma told Khan. When Khan protested, Sharma continued his offensive diatribe even as speaker Ram Niwas Goel was seen requesting him to stop. Goel later had to adjourn the House for 30 minutes. AAP विधायक @KhanAmanatullah को सदन में कहा आतंकवादी ! His statements sparked strong reactions with both chief minister Arvind Kejriwal and his deputy Manish Sisodia demanding an apology from the MLA. However, even after the outrage, Sharma remained defiant and justified his statement. “I used the term terrorist and will use it again. I used it in the context of him creating an atmosphere of terror in the House by shouting down the voice of the Opposition. Is this not a kind of terrorism,” he said, reports Indian Express. He added that he doesn’t need the ‘certificate of patriotism’ from Kejriwal who questioned Indian Army’s surgical strikes and had supported JNU students who raised ‘anti-national’ slogans. Sharma, a habitual offender, has made several controversial statements in the past. In 2015, he was suspended from the Delhi Assembly for making misogynistic and inappropriate remarks against AAP MLA Alka Lamba. Sharma had referred to her as “Ye toh raat bhar ghumne wali (the woman who roams at night), during a discussion on the homeless and night shelters. Sharma later said he ‘regretted’ what he said but did not apologise. In February 2016, he was caught on camera assaulting a CPI worker outside the Patiala House court complex. He was arrested and later came out on bail. Upon being asked the reason behind the attack he said that he was just stopping the victim from chanting slogans in favour of Pakistan. He also said that he would have shot the CPI worker if he had a gun at that point of time.